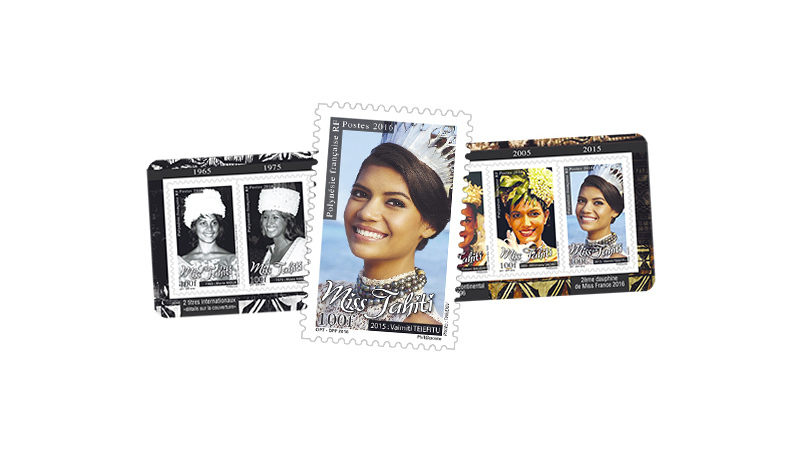 This 6 stamps booklet is the first dedicated to Miss Tahiti, an institution in French Polynesia for over 50 years. It presents 5 back in time five decades from MISS TAHITI 2015, Vaimiti TEIEFITU, magnificent second runner-up of Miss France 2016. • Ten years earlier, Mihimana SACHET, 22 years old already working at the Chamber of commerce in Papeete was propelled Miss Tahiti 2005. The young lady has the entrepreneurial spirit and still launches a successfull consulting business in Tahiti but also overseas. • Timeri BAUDRY, Miss Tahiti 1995, has also a dynamic personality. Elected at age 21, she met Mandela at the Miss World pageant in South Africa and won the title of Miss Intercontinental 1996 in Germany. She manages commercial quality in an airline, she is honorary consul of South Korea. • Ruth MANEA, celebrated her 18th birthday on June 15th, 1985, when she was elected Miss Tahiti 1985 at the hotel Tahiti. The shy girl from the island of Tahaa is quick learner, she leads a brilliant career as a teacher. She also presides over the French Polynesia tennis federation. • After her election as Miss Tahiti 1965, Moea AMIOT part in the Miss France 1976 pageant where she won the title of 2nd runner up , and also participated to the Miss Universe pageant the same year. Moea then combines her teaching and a businesswoman career by opening several stores in Tahiti which are still very successfull. She is the mother of Leiana Faugerat, now manager of the Miss Tahiti committee brand company. • Marie MOUA, 20, was elected Miss Tahiti 1965 on July 9th, 1965 in the gardens of the city hall of Papeete. Marie MOUA made a dazzling international career being the first Polynesian to climb twice on an international podium. She ranked fourth runner up at Miss World and 3rd runner-up at Miss International in 1965. She worked at the tourism office and was a municipal councilor of the city of Punaauia. Marie MOUA is a myth today in French Polynesia, humble, beautiful, natural, an ambassador of choice for a dream destination.